When you have revenue goals to meet, you don’t have the time to waste on developing FB campaigns yourself. You need a partner that understands your business as well as we do. "Facebook Ads Won't Work for My Business"
Many of our customers get started with Facebook ads because they want to scale their business. They believe Facebook’s reach can bring more traffic to their site creating more leads and more sales. Not having the time or in some cases the staff to dedicate to developing a Facebook campaign, they look for an agency they believe can help. Unfortunately, what they don’t realize is that some digital marketing companies are more interested in their own internal objectives than they are about their clients. This is wrong and it shouldn’t be this way. The simple truth is, without the right partner losing money on Facebook is easy. Which can lead you to believe that Facebook ads can’t work for your business. This is especially true when you choose an agency who doesn’t understand YOUR business objectives. At Clicks and Clients, we believe the only way to truly get more sales from Facebook advertising is through partnership and transparency. Without this openness, Facebook ads may not work for your business as well as they do for the agency you’ve hired in the past. Bill Kingston from Crazydogtshirts.com, understands what it means to find the right partner. Starting with our Discovery Call, we strive to understand YOUR business goals. That’s why we obsess over knowing where you are today and where you want to go. This ensures that together, we can develop the right plan to achieve your objectives. If you’re ready for your customer data to work for you so you can find more leads and capture more sales, click the button below and schedule your Discovery Call today. Targeting the wrong customer with your Facebook ad campaign can impact your return on investment. In fact, this is just one of several variables to consider when developing a successful Facebook campaign. In addition, you need to consider your current customer data, selecting the correct image, writing great copy, optimizing your landing page and properly using remarketing as a part of your campaign. A simple misstep in any one of these variables can result in lost leads and lost sales. 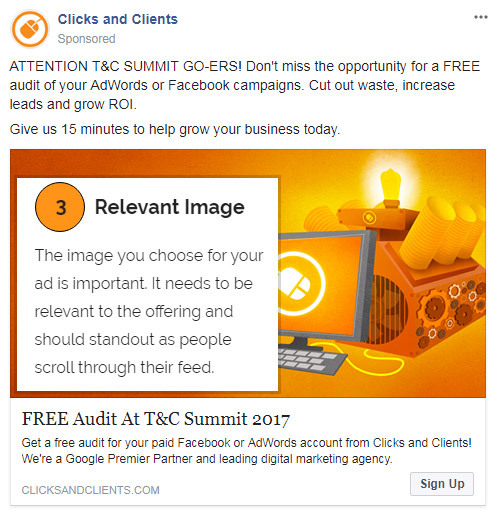 Having created hundreds of Facebook ads for our clients, we understand how confusing and frustrating setting up your ad campaign can be. That’s why we embrace transparency. From our initial Discovery call to developing your ad campaign, your ad sets, and your ad, we partner with you and your business to ensure success. Every step of the way we’ll tie our efforts directly to watching your return on investment grow. If you’ve struggled to scale your business with Facebook Ads and you’re ready to use it more effectively to get more leads and sales, then click the button below and schedule your Discovery Call today. Together, we’ll map out a plan to target your ideal audience and achieve your business objectives. Your company logo. The image size needs to be 40X40 pixels so having good resolution is important. You only have a second or two to capture someone's attention with your copy. To do this the copy needs to be about them not about you. This is the BOLD part of the ad. In our experience, the best performing ones tell your customers what to do. Like the Headline, the Button is also a call to action. The button links to a specific action or sales page.